Have you ever wondered, how you could get an alternative to U.S. News? Would you like to enjoy a “Sunntigs-Jass” show, “Schweiz Aktuell”, or be informed in more detail about topics that are only briefly discussed on American Television? Today’s technology allows you to watch SwissTV SRF anywhere you have a WiFi signal. Add to that an AppleTV, and you’ll enjoy your favorite SwissTV SRF shows on your HD equipped television. Meet LA’s celebrity private chef Raphael Gamon, with fellow “TEAM SWISS” teammates and best friends from Zürich, Ulf Diegmann (fb) and Martina Cipolat (fb) – on their way to San Francisco to participate in this year’s AIDS/Lifecycle, (#ALC11) the 11th edition of the largest fundraiser benefiting the San Francisco AIDS Foundation and the Jeffrey Goodman Care Clinic at the Los Angeles Gay & Lesbian Center, two organizations that provide life-saving services to those with HIV/AIDS, regardless of their ability to pay. As a young girl, she always longed for the American way of life she had learned of by secretly perusing magazines and brochures laying around her dad’s American automobile import business. The glamour, the fascinating people, the vast beaches, the ocean, the beautiful weather and the beautiful cars. Doris arrived at majestic Los Angeles Union Station after having boarded her first plane ever from Zurich to London. She then boarded a long and stormy transatlantic journey on one of the first -four engine propeller flights by “American Overseas Airlines” flights to New York, followed by a transcontinental railroad adventure lasting many days. People told her to watch out for Indians!! The only person she knew in LA was a Swiss pen-pal she had been corresponding with. Before starting the journey, Doris wrote her the arrival details, never knowing if the letter had actually made it! What a relief when she finally met her friend waiting at the Station! She became the first consular secretary at the Swiss representation in Los Angeles. All by coincidence – or was it fate? The appointed incoming secretary from Bern was terribly ill, and the consul asked Doris during an unscheduled meeting “Can you steno in French, German and English? – “Of course I can…” (did she really?) The Consul immediately cabled to Bern, asking for permission to hire Doris as a local staffer – and BAM – she got the job! It was meant to be, if you ask me. She loved working at the Consulate. 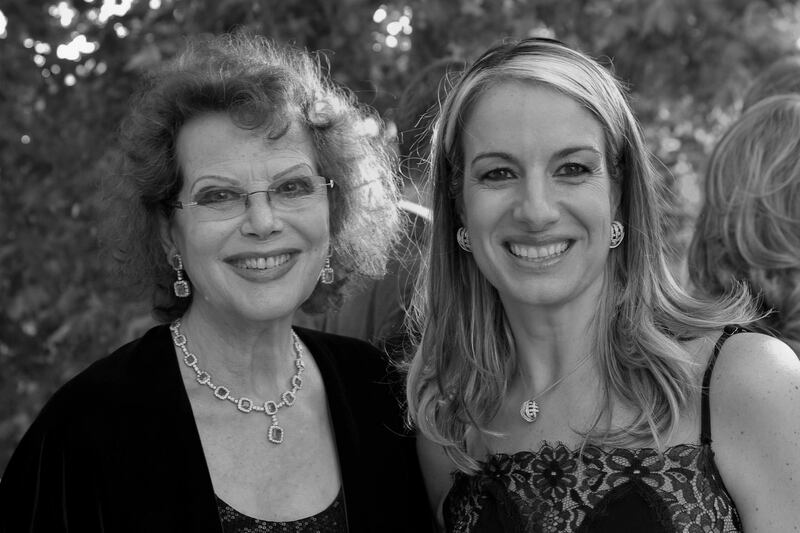 She met many dignitaries, entertainers and philanthropists (whom she particularly respected), never forgetting that EVERYONE has an important role to fulfill during their lives – and witnessed the growth of a vibrant Angeleno-Swiss community. Her many stories ranged from getting people out of jail, to joking around with Showmasters – all the way to a “Wild-West-style” shooting at the consulate’s first location Downtown, which then led to a move to the Westside “to get away from this dubious neighborhood”… only to be confronted at that location by a bomb that ended up not detonating because, as Doris said, “..I bet they didn’t have a Swiss movement in that Timer”! Doris also often reveled in stories about her second transatlantic voyage – on the famed cruise liner “Andrea Doria” – The ship that sunk a couple of weeks later in what became one of history’s most infamous maritime disasters. Imagine, Doris (and the Mother, who had joined her on that trip), traveling in style on one of the most luxurious ocean liners rivaled at the time only by the two “Queens” (The Queen Elizabeth and the Queen Mary). Always the nonconformist, Doris would wear pants when it was not yet OK for young ladies to wear them – In her work she sometimes stepped on other people’s toes, only to then receive a bad review – but she didn’t care – if it was the right thing to do, she would do it. She navigated SoCal freeways like a pro – and at cocktail receptions she would talk to everyone – ignoring warnings that it’s not proper to speak to married men, as a single lady. She always wore her signature fire-engine red outfits – making her stand out in any crowd – despite her petite stature. When asked if she feels like an American or a Swiss – she always responded – “I’m exactly half & half – I’m proud of my Swiss heritage and to be born in such a magnificently beautiful country – and now I get to enjoy the Best of both Worlds! Doris embraced technology and a whole new world of communication: she learned how to use digital cameras – and LOVED her Mac computer, describing it as “Höllisch Toll”. (Hellishly Amazing). She loved the endless research resource offered by the Internet – and occasionally cursed it, too of course! Long before computers, blogs and websites, Doris brought the community together with her widely read Newsletter stories and her active participation at every Swiss event in southern California. – Never Give Up – tomorrow will be a better day! We salute you, Doris – and know you are resting in peace, among the many Angels that make up this beautiful city you called home for most of your life. All your friends, colleagues and loved ones will think of you often and remember your picture taking, article writing and bright feisty spirit. Rest in peace and enjoy the Best of both Worlds in your new role as Guardian Angel of all Angeleno-Swiss. As a recent transplant to LA, Alissa (http://www.gelatobaby.com) is aware that her adopted California Lifestyle comes with a Caveat… One has to live with Earthquakes. The lessons we learn from other disasters are very simple: Last year Alissa wrote this very smart story for GOOD.IS about getting ready for the inevitable. In view of the recent East Coast Disaster, we thought it would be appropriate to publish the story as a reminder for us Californians to Get Prepared! Making sure your family is ready is one of the best things you can do to for your city. If every citizen has the basic resources to sustain themselves for a few days after a disaster, relief workers won’t get overwhelmed by providing food and water to the unhurt but unprepared. Plus with basic medical supplies in each home, agencies like the Red Cross can focus on helping the people who really need their services. So why not take this weekend to do something good for your city, and get prepared? We found some great resources for making this process as simple, easy, and fun (yes, fun!) as possible. First, start thinking about earthquakes as a timeline, using the Seven Steps for Earthquake Safety that can give you a simple, seven-step path from preparedness to recovery. Two steps to note: Making a disaster plan including two places to meet (the second being a backup in case the first isn’t safe), and assembling an emergency kit with enough food, water, and medical supplies. And remember you’ll need three of these: For home, work, and car. Now, think about where you’ll be when an earthquake strikes. Notice in the videos of earthquakes how most people run outside? Not a good idea. Neither is standing in doorways. Drop, Cover, and Hold On uses easy-to-read graphics to show you exactly what to do, no matter where you are. If an earthquake strikes when you’re in bed, do you know what to do? Now you do. Finally, hold a dress rehearsal. The Great California Shake Out is a state-wide drill that happens annually each October. There’s information there on how to participate. But there’s no reason why you can’t conduct your own this weekend.